Cary, NC, June 4, 2018 – Biomimetics in nonwovens, lightweighting of auto materials, battery separator developments, and the latest in electrospinning nanotechnology will be among the topics of forward-looking presentations for technology professionals tasked with following breaking industry developments. 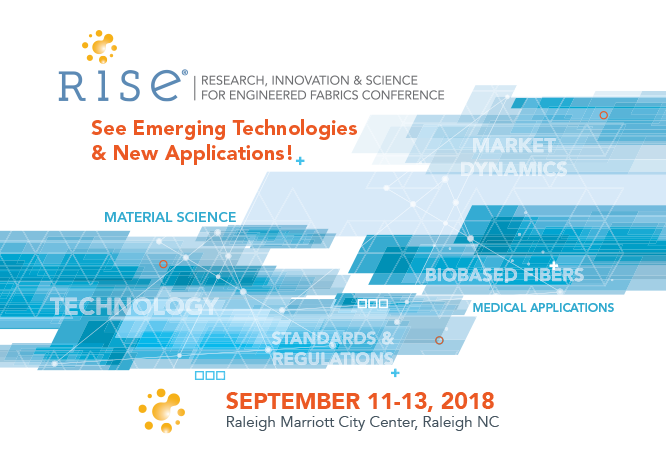 The eighth edition of RISE, the conference on Research, Innovation and Science for Engineered Fabrics, is set for Sept. 11-13 at the Marriott City Center in Raleigh, NC. Designed for professionals working in materials technology, R&D and new product development, RISE 2018 will provide cutting-edge sessions on game-changing innovations, market developments, new applications and major research trends. Other topics of interest will include the medical segment; testing, standards and regulations; and web formation and technology. RISE also will feature up-and-coming talent with postgraduate doctoral degree students from the Nonwovens Institute at North Carolina State University presenting their research, plus the announcement of this year’s RISE Innovation Award winner. A tour and reception at the Nonwovens Institute’s nearby facilities on Centennial Campus will take place on the evening of Sept. 12. On top of the dynamic educational program with 25 engaging speakers from business and academia, RISE 2018 will connect technology trailblazers with industry leaders to network and socialize throughout the event, all in the vibrant high-tech Research Triangle hub of Raleigh. Nearly 150 technical professionals attended last year’s event. Registration is now open on the RISE website. Hot topics for RISE 2018 include: New Cellulose Based Nonwoven Fabric Technology; Microfibers and their Affect in the Marine Environment; Reflecting Fibers for Nonwoven Applications; Drapes and Gowns Used During Robotics Surgery; Current Auto Materials Technology and Future Material Trends; and Crowd Solving Solutions for Recycled PET Fiber. A unique intensive focus will be devoted to biomimetics, the use of nature-inspired technologies to address performance challenges using fibers and fabrics. Industry experts who will share their case studies and approaches are: Christina Agapakis, Ginkgo Bioworks; Jeff Dugan, Fiber Innovation Technology; Jeffrey Bates, University of Utah; Jeannette Yen, Georgia Tech; Marie O’Mahoney, consultant; and Molly Morse, Mango Materials. Keynote speaker Mark Vintner, Managing Director, Senior Economist, Wells Fargo will give a lively talk on the North American economic and political forecast entitled How Long Will the Good Times Roll? Conference attendees also will learn the latest developments in lightweighting in the auto industry, including presentations on lighter, thinner battery separators and the outlook for auto materials with changing standards. Plus, speakers will address developments such as microfibers in the marine environment, nanofiber electrospinning, the first standard related to e-textiles, foam-forming nonwovens, and a novel method for evaluating nonwoven uniformity. Nominations are now being accepted online for the RISE Innovation Award that recognizes innovation in areas within and on the periphery of the nonwovens industry that use advanced science and engineering principles to develop unique or intricate solutions to problems and advance the use of nonwovens. Last year the award was presented to Club Coffee LP for its PurPod100™ Compostable Pods, a certified 100 percent compostable pod for the single-serve coffee process. Finalists will be selected by INDA’s Technical Advisory Board and will make presentations at RISE. Conference attendees will have a vote in deciding the winner that will be announced on Sept. 13 to conclude the conference. For complete program information, visit the RISE 2018 website.